(No need to input date, time, location etc as it is automatically printed on photo as can be seen before submitting). Once submitted, you are ready to report next offence. Once you tap on your app / logo, screen 1 (as abv) will appear and immediately screen 2 (abv pic) where you can see the status or updates about your reported cases such as Total violation reported, Total approved, total points earned, Total pending and total Rejected. If there is any apprehension about your safety or if anyone is threatening you for being a Sentinel, dial 100 or 7875756000 or whatsapp on their mobile number. We are committed to protect our Sentinels. All those who have attacked Sentinels have been booked in criminal cases as well as under preventive sections of law. 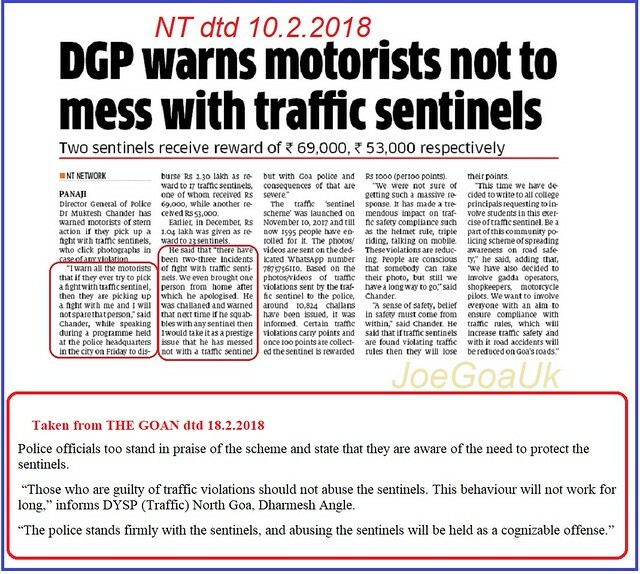 Goa Police Traffic Sentinel Scheme launched on 10th November 2017. in just about 100 days, about 19,000 ?sentinels registered. It was reported one sentinel (not me :-) ) sending upto 300 per day which means earning minimum 900 points and Max 3000 points a day. Each point equals to Rs.10 cash i.e. 300x3= 9000rs per day. it must be a full time job for him. You too can utilise your spare time, students can make pocket money too. Just visit some busy roads, city, junctions, theatres, halls, events etc and you will find plenty of cases to report to.. e.g. one can come to Kala Academy or at Campal SAG grounds or opp Inox Children park etc where one can see footpath area always full of cars and bikes. One can even take a walk up and down 18 June Road to check parking on Zebra crossing lanes, footpath parking near Junta House, Yes Bank etc. Just 3 reportings per day can fetch you minimum of Rs. 9000 per month. There is no limit as to number of reportings per day. What more? You also stand a chance to win a bike or Maruti car (draw every 3 months? 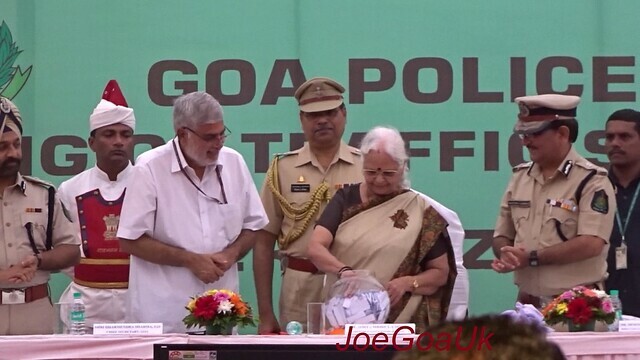 Remember, by reporting traffic offences you are not only helping Goa Police but also the society at large. Good luck!! Minimum points earn per reporting is 3 and Max 10 depending on type of traffic offence. Plus chance to win motor bike every few month? return for spotting traffic violations on the state's roads. 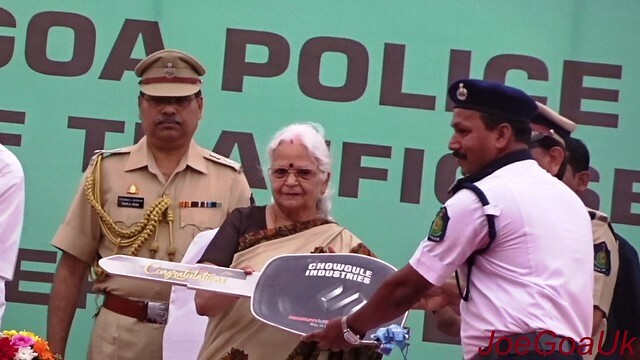 Over 350 registered in 3 days..
PANJIM: Beware traffic violators! 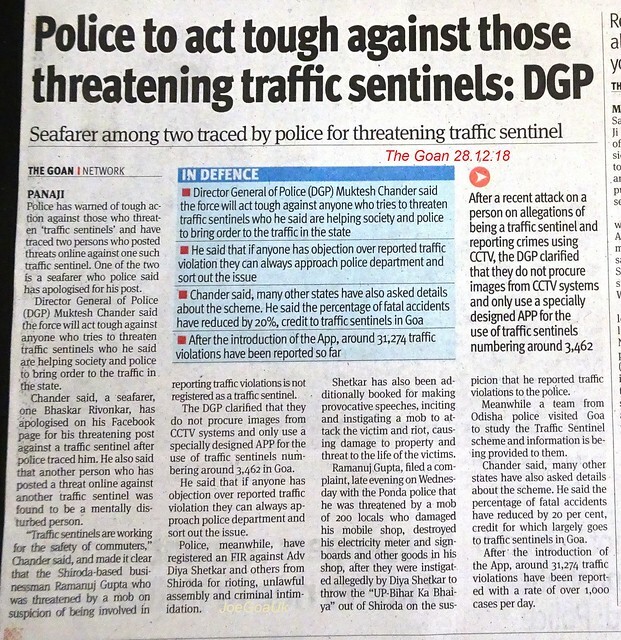 Over 350 ‘Traffic Sentinels’ are reporting traffic violations across the State to the Traffic Police. 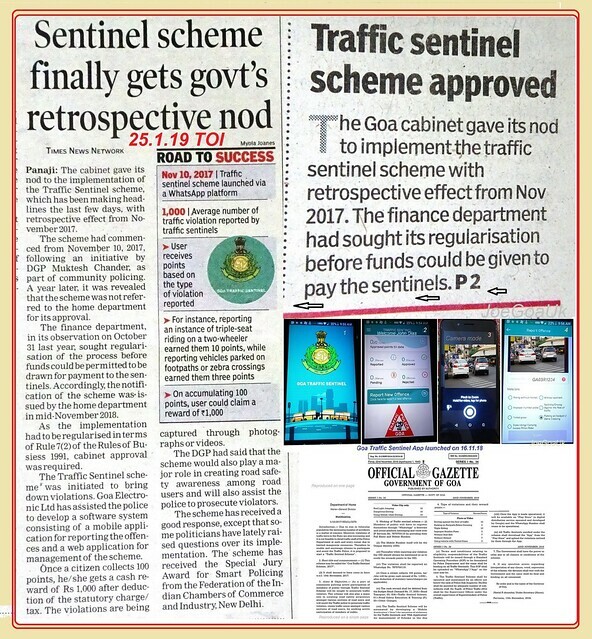 Goa Police’s innovative community policing initiative – Traffic Sentinel Scheme – received over 350 registrations within three days of its launch. 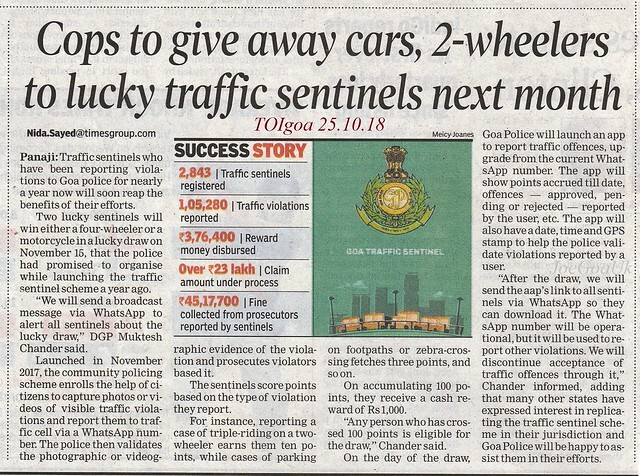 The scheme invites people to help in enhancing traffic management by capturing a photo or a video of a traffic violation and reporting it to the Traffic Police via the social media. 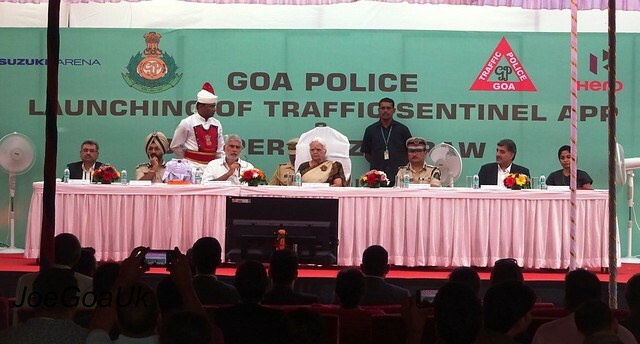 “So far, more than 350 Traffic Sentinels have enrolled and are now clicking traffic violations all over Goa. Anyone can join the initiative,” Director General of Police Muktesh Chander told Herald. “The photo/video with clear view of the registration number of the defaulting vehicle, time & date of violation, place of violation and type of violation needs to be informed to report a traffic violation. There are 10 types of violations that can be reported through this scheme,” the officer said. Reporting violations will fetch the volunteer reward points and once he/she accumulates 100 points, the department will offer a cash prize of Rs 1000. 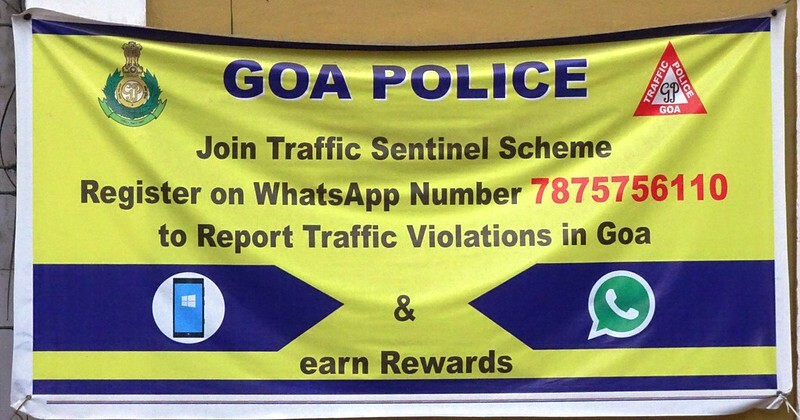 Panaji: Goa traffic cell receives on an average 1,000 complaints per day from around 1,500 citizen sentinels linked to its WhatsApp platform under the traffic sentinel scheme. 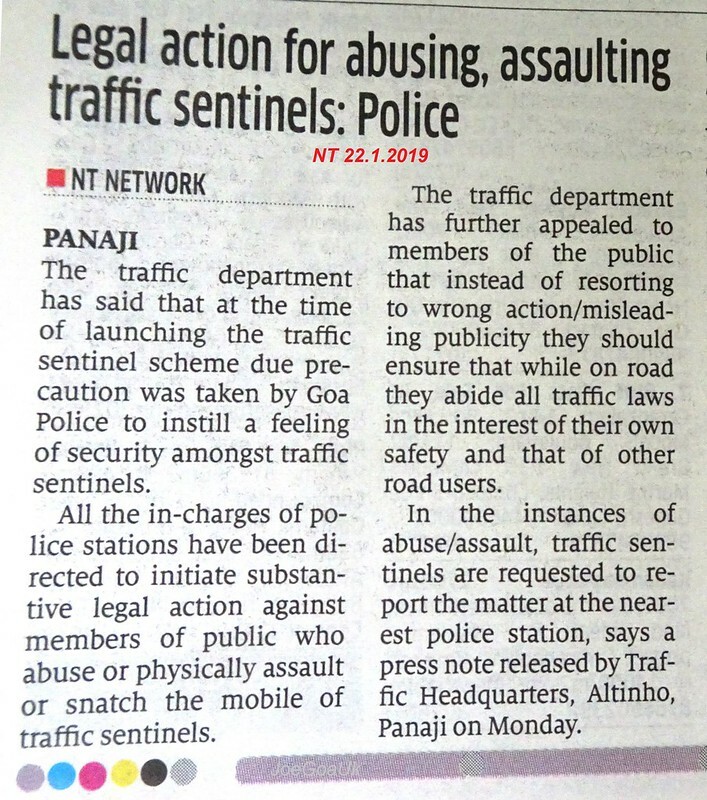 Informing that the sentinel scheme has been receiving good response from people, superintendent of police (traffic) Dinraj Govekar said that the cell sometimes receives 300 cases of violations from a single sentinel. 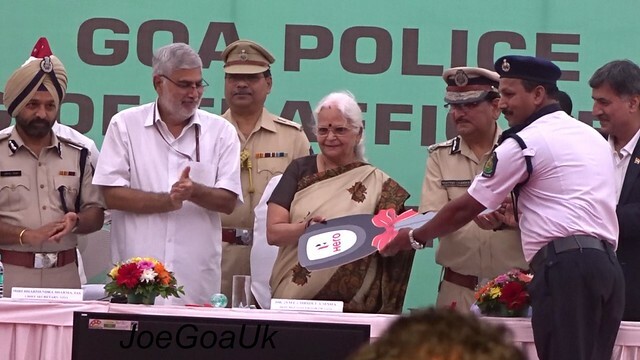 On November 10, director general of police (DGP) Muktesh Chander had launched the scheme wherein citizens could report traffic violations on WhatsApp and earn cash rewards. Based on the type of violation, the user is entitled to certain points. For instance, reporting a violation of triple-seat riding on a two-wheeler will earn them 10 points, while parking on footpaths or zebra crossings will accrue three points. On accumulating 100 points, the user can claim a reward of Rs 1,000. A lucky draw will also be held, wherein a sentinel may win either a motorcycle or a car. 1. What is Traffic Sentinel Scheme? 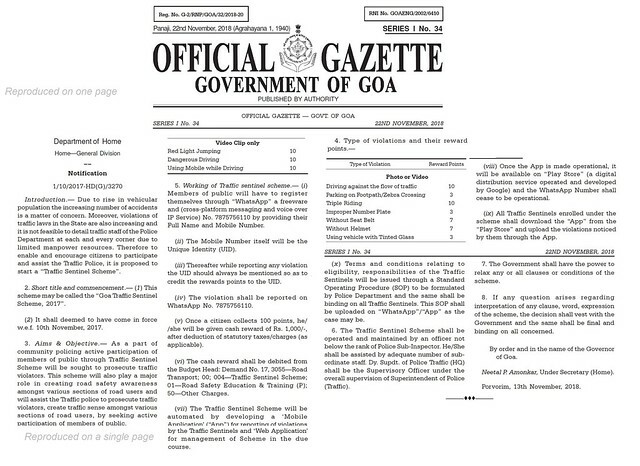 of Facebook Page of Goa Traffic Police. 2. Who is Traffic Sentinel? Ans. 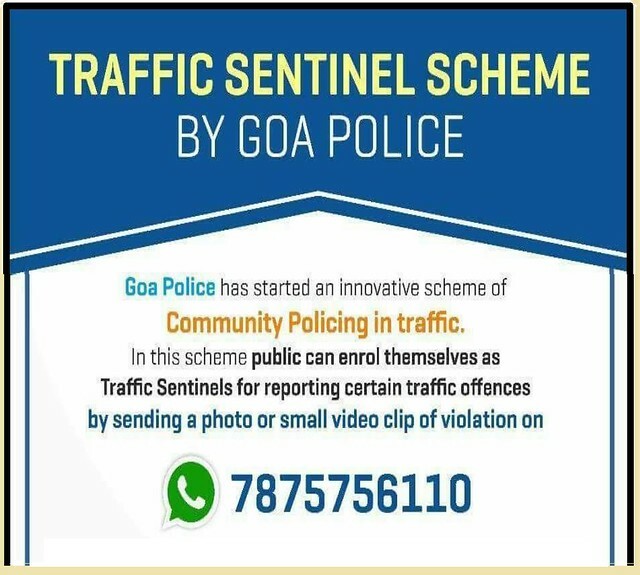 Traffic Sentinel is a person who reports traffic violation committed on Goan roads using WhatsApp (7875756110), E-Mail (sptrafficgoa@gmail.com) or Facebook Page (Goa Traffic Police). Predefined reward points for different violations will be credited in the account of Traffic Sentinel for each violation so reported. 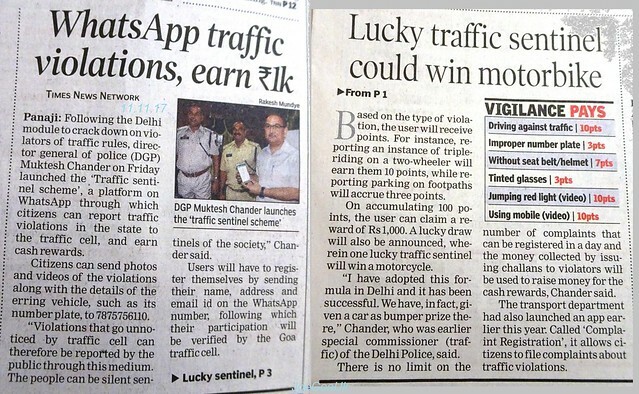 Once the Traffic Sentinel accumulates 100 Points he/she will be given cash reward of Rs. 1,000/-. 3. How one can become Traffic Sentinel? Ans. One has to register by providing his name, mobile number and email ID on WhatsApp Number 7875756110. His/her Mobile Number will be his/her Unique Id. 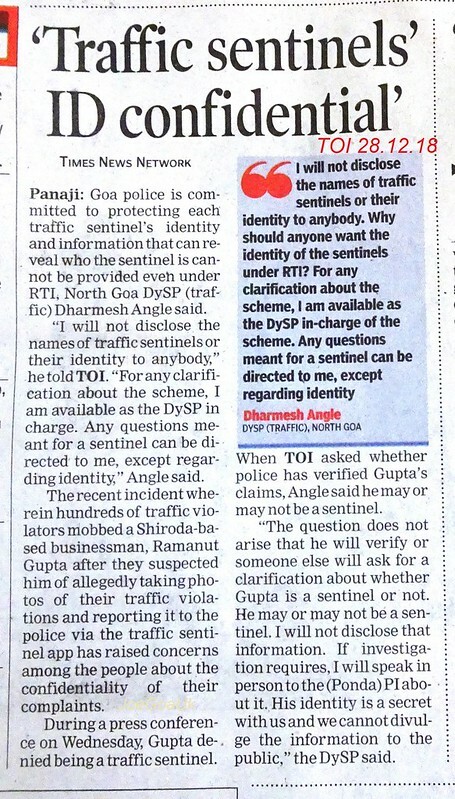 Thereafter can start reporting traffic violations through WhatsApp (7875756110), E-Mail (sptrafficgoa@gmail.com) or Facebook Page (Goa Traffic Police) by compulsorily mentioning his unique Id. 4. What type of violations can be reported through this scheme and what are the credit points for different violations? 5. What all is required to report a violation? Ans. The following information needs to be sent while reporting traffic violation. The photo/video if possible should be clicked/recorded by keeping GPS in ON Mode for getting exact date and time. 6. How can I see my reward points? Ans. Once 100 points are accumulated the concerned citizen will be intimated via e-mail. Nevertheless, the citizen can inquire through WhatsApp, E-Mail, Facebook the status of their points. 7. 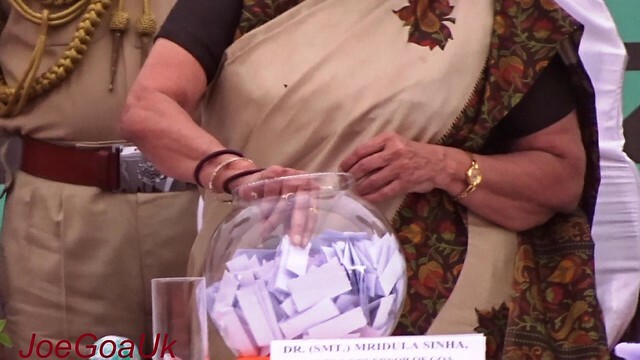 What kinds of rewards are being given in the scheme? Ans. 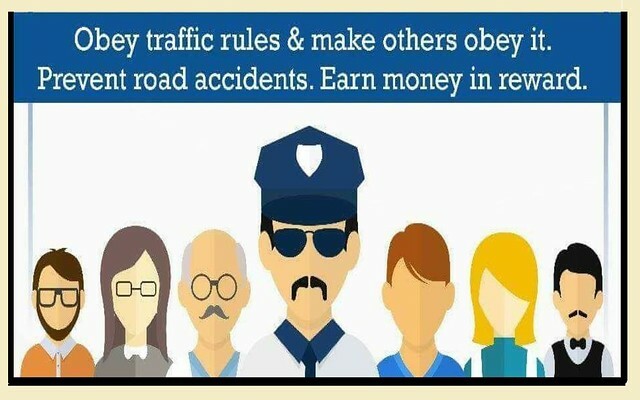 Once the Traffic Sentinel accumulates 100 Points he/she will be given cash reward of Rs. 1,000/-. 8. Can I report multiple violations? Ans. Yes. Traffic Sentinel can report multiple violations in a single reporting. For example, if the picture sent by Traffic Sentinel shows a person driving motorcycle without Helmet and stopping beyond stop line, than it will be counted as two violations and each violation will have separate reward points. Also a Traffic Sentinel may send as many photos/videos for reporting different traffic violations as he/she wishes. 9. What is my reference ID? 10. What could be the reason for a reported violation for not getting the reward point? Ans. If a picture or video of a reported violation does not clearly indicate the violation committed or the vehicle number is not clear then this reported violation will be discarded and will not get any reward point. 11. What is the responsibility of a Traffic Sentinel in legal aspect?